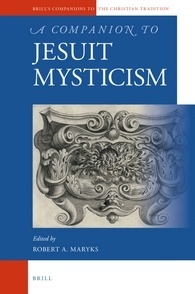 Brill has published A Companion to Jesuit Mysticism, edited by Robert Maryks, a collection of thirteen essays on the mystical tradition of the Society of Jesus. According to Brill, this tradition is a “somewhat neglected aspect of Jesuit historiography.” Several key figures in the Jesuit mystical tradition are examined, from Baltasar Álvarez to Louis Lallemant to Hugo Makibi Enomiya-Lassalle. A Controversial Mystic: Father Baltasar Álvarez, by Manuel Ruiz Jurado, S.J. Louis Lallemant and his Doctrine spirituelle: Myths and Facts, by Tibor Bartók, S.J. Claude La Colombière (1641–82), Marguerite-Marie Alacoque (1647–90), and Devotion to the Sacred Heart, by William P. O’Brien, S.J. Science as a Mystical Quest: Pierre Teilhard de Chardin, by François Euvé, S.J. Karl Rahner (1904–84) and His Mystical Theology, by Harvey D. Egan, S.J.